Thanks for taking the time to read a quick note from Steve Kazella of Airwave Management, cell tower landlord advocate. Hello, this is Steve from Airwave. We really do not use our newsletter subscriptions too often, in fact, the last time we sent out a newsletter update was when we were interviewed by the New York Times back in the summer of 2010. We won't bug you or take up a lot of your valuable time. Thank you to the thousands of you who have signed up for our free industry newsletter. Many of you have subscribed or asked questions on our cell tower leasing blogs. 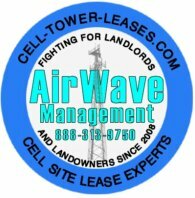 If you have any questions about cell tower lease rates, please post them on www.AirwaveBlog.com and we will do our best to answer them. If you are trying to get a cell tower on your property, we can't help you, but if you go to www.GetaCellTower.com you can submit your property to the cellular carriers or to the tower companies. Okay. Here's the reason for our timely and important newsletter update. This is for Cell Tower Landlords in the USA, Canada, Mexico and South America only. Looking into 2016, there are disruptive technology changes coming to the cell tower industry that will start to affect cell tower landlords in the next 3 to 5 years, and which will ultimately result in wide scale rent reductions to your cell tower income and bring lower cell site lease rates, primarily in urban areas and in the metropolitan areas where 90% of cell phone users live, and cell towers are located. Cell tower landlords will be affected by these changes in one way or another starting in the next 3 to 5 years, and there are certain steps that you can take to be ahead of the hoard as they "exit the theater" so to speak. We are not going to yell "fire" just yet, but you need to give us a call to discuss. You want to be well ahead of the curve on this one. Please call us at 888-313-9750. Find Airwave Management on Facebook. Follow Airwave Management on Twitter.